Going from Bali to Gili Trawangan or return is very easy. Most of the fast boats from Bali to Gili Island stop at Gili Trawangan. Gili Trawangan is one of the main objectives of the tourists to visit when they come to Lombok. Many travelers also think that Gili Trawangan is a separated island, not part of Lombok because the name of Gili Trawangan more famous than Lombok. To get Gili Trawangan is very easy today because the fast boat operators making Gili Trawangan as a primary destination. 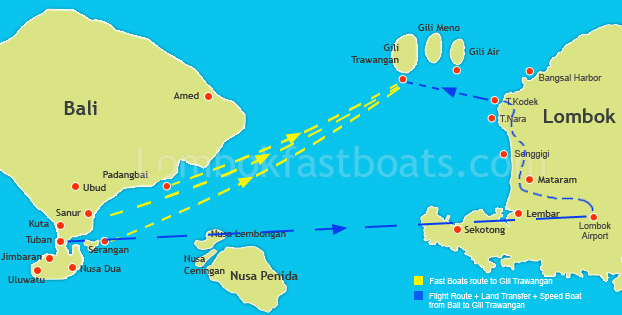 We recommend to use the direct fast Boats Bali to Gili Trawangan because more efficient and spend not to much money. To see more detail of each boat click the name of the boat. To order a ticket, simply fill the form on the side. Some recommended direct boat to Gili Trawangan: Marina Srikandi 12, Bluewater Express, Gili Cat and Gili Gili Fast Boat. We can also reach Gili Trawangan from Bali by flight. Many domestic flights such as Citilink, Lion Air, Garuda Indonesia, Trigana Air offering transfer between Bali and Lombok. Your flight will be landed at Lombok International airport, from the airport you can use taxi or private car to read Bangsal, Teluk Nare, Teluk Kodek or Mentigi bay where you can use the public boat or charter boat to Gili Trawangan. Land transfer between Airport to Bangsal/ Teluk Nara about 2 hours and see transfer between Bangsal/ Teluk Nara about 30 minutes by public boat or 15 minutes by charter speed boat.